Around Mom's Kitchen Table: Why Teach Your Kids to Sew? Why Teach Your Kids to Sew? Why Teach Kids to Sew? Whether they learn to make their own clothes, doll clothes, purses, back packs, hats, toys, etc., or just learn enough to mend the clothes they buy, sewing for kids is a skill that will help them maintain their wardrobes for a lifetime. My mom sewed all our dresses, tops, shorts, and pants when I was growing up. On occasion, she made hats and purses, too. Since she sewed so much and so often, it was natural that my sister and I would want to learn to sew. Sewing for kids is a lifelong skill that will help them be independent! The first thing I ever sewed was a headband to hold my hair back. After that, I made small pillows, a purse, and lots and lots of doll clothes. My mom gave us permission to use any leftover fabric from her sewing projects, and that was usually more than enough to make the small items we needed for Barbie dolls. It was such fun to design our own doll clothes and have things in our doll cases no one else in town had. It wasn't long before we graduated into making tops, shorts, and skirts. By the time I was in high school, I was sewing almost all my own clothes. I even made my own wedding gown, and many years later, my daughter's wedding gown! Sewing is an art form, a frugal addition to any family, and a fun craft. You can make anything from potholders to dresses to sleeping bags to purses to mittens to curtains on a sewing machine. The links below open in with YouTube videos that show kids how to work through specific sewing projects. Don't buy a toy that won't last. Buy a budget priced sewing machine instead! 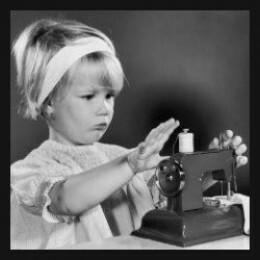 Buying a toy sewing machine is a waste of money. They don't last long, and if your child really wants to learn to sew, the toys will not give them the versatility to learn more than straight stitching. Rather than spend $30 on a toy that breaks after using it a few times, why not buy a low priced sewing machine that will provide years of service to your child? Sure, kids can get hurt on a sewing machine, if they are not taught to be careful, but they can get just as hurt on a toy sewing machine. After all, needles are sharp, regardless which machine they are on. I learned to sew on my mom's Singer sewing machine when I was about seven or eight years old. I don't remember ever getting my fingers caught under the needle, but she sat with me and explained all the ways I could get hurt and how to guide fabric through the needle so that I would be more careful.